Aubrey says he had some instructions in drawing from the celebrated Sam. Cooper, but does not know whether this was before or after he went to Lely. He gives us an apecdote of Hooke, however, which is very characteristic of that sordid regard for money which predominated all his life. His father left him 100l. which was to have been paid as au apprentice fee to Lely; but after he had been some time upon trial, Hooke left him, as thinking he could do all that was to be done, and keep his hundred pounds. When he went to Busby’s he “lodged his 100l. with him.” Letters by Eminent Persons, 1813, 3 vois. 8vo. Afterwards he was kindly taken by Dr. Busby into his house, and supported there while he attended Westminster-school. 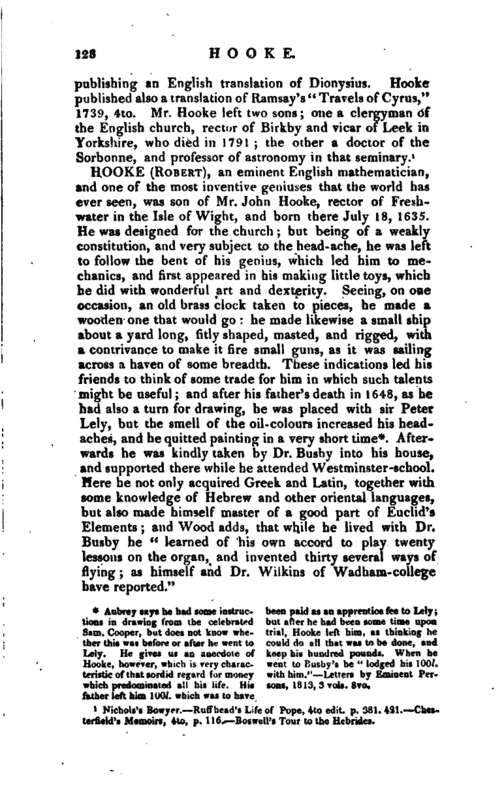 Here he not only acquired Greek and Latin, together with some knowledge of Hebrew and other oriental languages, but also made himself master of a good part of Euclid’s Elements; and Wood adds, that while he lived with Dr. Busby he “learned of his own accord to play twenty lessons on the organ, and invented thirty several ways of flying as himself and Dr. Wilkins of Wadham- college have reported.” | About 1653 he went to Christ-church, Oxford, and in 1655 was introduced to the philosophical society there; where, discovering his mechanic genius, he was first employed to assist Dr. Willis in his operations of chemistry, and afterwards recommended to Mr. Boyle, whom he served many years in the same capacity. He was also instructed about this time by Dr. Seth Ward, Savilian professor of astronomy, in that science; and from henceforward distinguished himself by a greater number of important inventions and improvements of the mechanic kind, than any one man had ever discovered. Among these were several astronomical instruments for making observations both at sea and land; and he was particularly serviceable to Boyle, in completing the air-pump. Wood tells us, that he also explained “Euclid’s Elements,” and “Des Cartes’s Philosophy,” to Boyle. In Nov. 1662, sir Robert Moray, then president, having proposed him for curator of experiments to the Royal Society, he was unanimously accepted, and it was ordered that Boyle should have the thanks of the society for dispensing with him for their use; and that he should come and sit among them, and both exhibit every day three or four of his own experiments, and take care of such others as should be mentioned to him by the society. He executed this office so much to their satisfaction, that when that body was established by the royal charter, his name was in the list of those who were first nominated by the council, May 20, 1663; and he was admitted accordingly, June 3, with a peculiar exemption from all payments. Sept. 28 of the same year, he was nominated by Clarendon, chancellor of Oxford, for the degree of M.A. ; and Oct. 19, it was ordered that the repository of the Royal Society should be committed to his care, the white gallery in Gresham-college being appointed for that use. 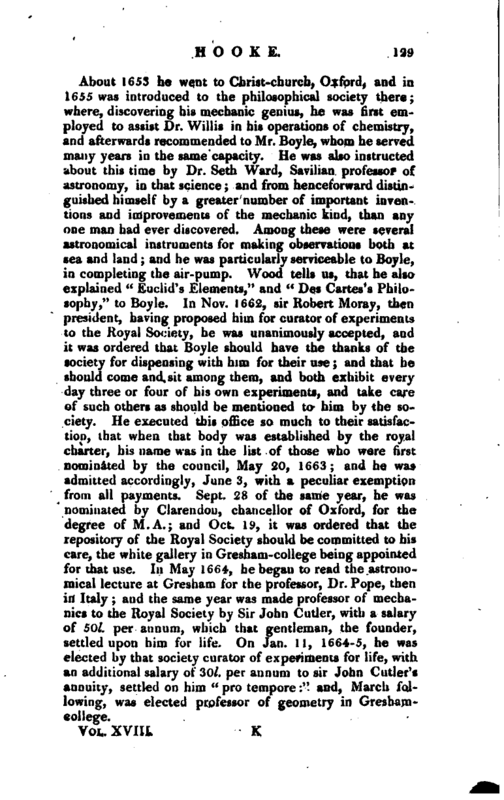 In May 1664, he began to read the astronomical lecture at Gresham for the professor, Dr. Pope, theri in Italy; and the same year was made professor of mechanics to the Royal Society by Sir John Cutler, with a salary of 50l. per annum, which that gentleman, the founder, v settled upon him for life. On Jan. 11, 1664-5, he was elected by that society curator of experiments for life, with an additional salary of“30l. per annum to sir John Cutler’s annuity, settled on him” pro tempore:“and, March folJowing, was elected professor of geometry in Greshamcollege. | In 1665, he published in folio his” Micrographia, or some philosophical descriptions of minute bodies, made by magnifying glasses, with observations and enquiries thereupon:" and the same year, during the recess of the Royal Society on account of the plague, attended Dr. Wilkins and other ingenious gentlemen into Surrey, where they made several experiments. In Sept. 1666, he produced his plan for rebuilding the city of London, then destroyed by the great fire; which was approved by the lord -may or and court of aldermen. According to it, all the chief streets were to have been built in regular lines; all the other cross streets to have turned out of them at right angles; and all the churches, public buildings, marketplacesj &c. to have beetl fixed in proper and convenient places; but the nature of the property, and the impossibility of raising funds to indemnify the landholders who would be injured by this scheme, prevented its being carried into execution. 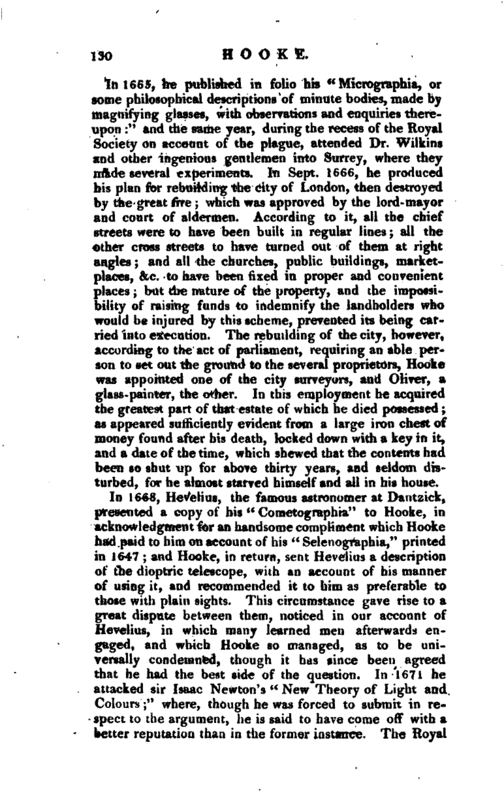 The rebuilding of the city, however, according to the act of parliament, requiring an able person to set out the ground to the several proprietors, Hooke was appointed one of the city surveyors, and Oliver, a glass-painter, the other. In this employment he acquired -the greatest part of that estate of which he died possessed; as appeared sufficiently evident from a large iron chest of money found after his death, locked down with a key in it, and a date of the time, which shewed that the contents had been so shut up for above thirty years, and seldom disturbed, for he almost starved himself and all in his house. In 1668, Hevelius, the famous astronomer at Dantzick, presented a copy of his “Cometographia” to Hooke, in acknowledgment for an handsome compliment which Hooke had paid to him on account of his “Selenographia,” printed in 1647; and Hooke, in return, sent Hevelius a description of the dioptric telescope, with an account of his manner of using 1 it, and recommended it to him as preferable to those with plain sights. This circumstance gave rise to a great dispute betwee’n them, noticed in our account of Hevelius, hi which many learned men afterwards engaged, and which Hooke so managed, as to be univeraiiy condemned, though it has since been agreed that he had the best side of the question. In 1671 he -attacked sir Isaac Newton’s “New Theory of Light and Colours;” where, though he was forced to submit in respect to the argument, he is said to have couie off with a better reputation than in the former instance. The Royal | Society having begun their meetings at Gresham-college, in Nov. 1674, the committee in December allowed him 40l. to erect a turret over part of his lodgings, for proving his instruments, and making astronomical observations; and the year following he published “A Description of Telescopes, and some other instruments,” made by him, with a postscript, complaining of some injustice done him by Oldenburg, the publisher of the “Philosophical Transactions,” in regard to his invention of pendulum watches. This charge drew him into a dispute with that gentleman, which ended in a declaration of the Royal Society in their secretary’s favour. Oldenburg dying in Aug. 1677, Hooke was appointed to supply his place, and began to take minutes at the meeting in October, and published seven numbers of the “Philosophical Collections,” which have been always considered as a part of the “Philosophical Transactions.” Soon after this be grew more reserved than formerly, and though he read his Cutlerian lectures, and often made experiments, and shewed new inventions before the Royal Society, yet’he seldom left any account of them to be entered in their registers, designing, as he said, to fit them for himself, and make them public, which however he never performed. 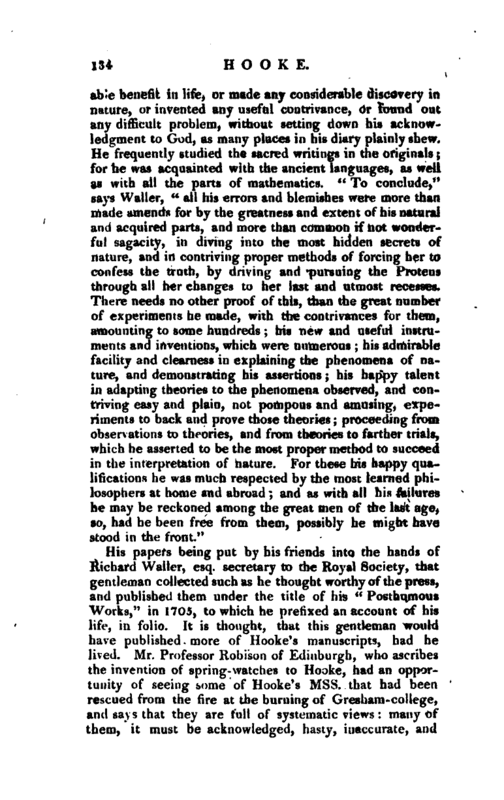 In 1636, when sir Isaac Newton’s Principia were published, Hooke, with that jealousy which was natural to him, claimed priority respecting the idea of gravitation. 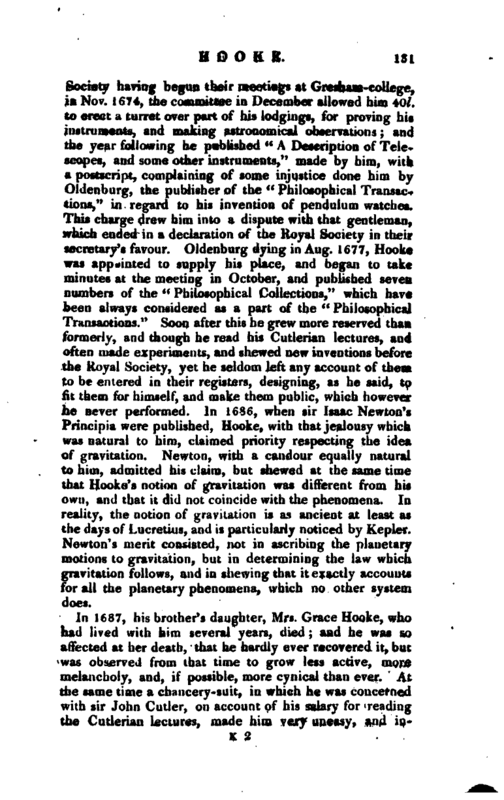 Newton, with a candour equally natural to him, admitted his claim, but shewed at the same time that Hooke’s notion of gravitation was different from his own, and that it did not coincide with the phenomena. In reality, the notion of gravitation is as ancient at least as the days of Lucretius, and is particularly notice<i by Kepler. Newton’s merit consisted, not in ascribing the planetary motions to gravitation, but in determining the law which gravitation follow:;, and in shewing that it exactly accounts for all the planetary phenomena, which no other system. does. In 1687, his brother’s daughter, Mrs. Grace Hooke, who had lived with him several years, died; and he was so affected at her death, that he hardly ever recovered it, but was observed from that time to grow less active, more melancholy, and, if possible, more cynical than ever. 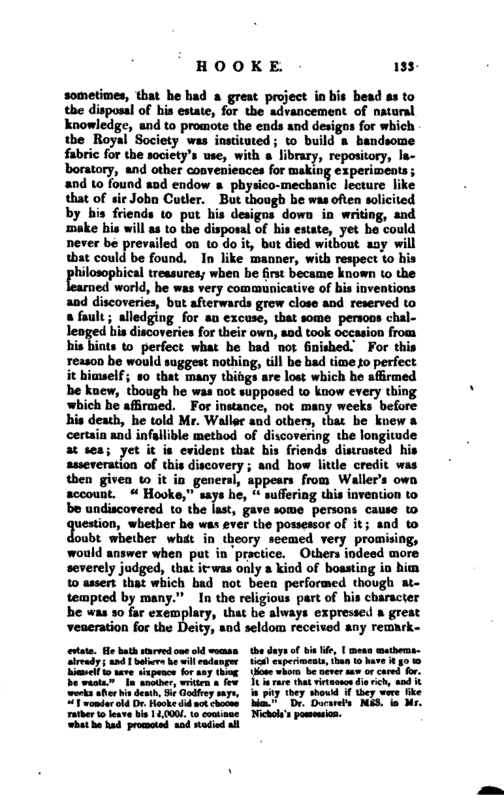 At the same time a chancery-suit, in which he was concerned with sir John Cutler, on account of his salary for reading the Cutlerian lectures, made him very uneasy, and | increased his disorder. In 1691, he was employed in forming the plan of the hospital near Hoxton, (bun Jed by Aske, alderman of London, who appointed archbishop Tillotson one of his executors; and in December the same year, Hooke was created M. D. by a warrant from that prelate. He is also said to have been the architect of Bedlam, and the College of Physicians. In July 1696, his chancerysuit for sir John Cutler’s salary was determined in his favour, to his inexpressible satisfaction. His joy on that occasion was found in his diary thus expressed “Domshlgissa that is, Deo Optimo Maximo sit honor, laus, gloria, in saecula saeculorum. Amen. I was born on this day of July, 1635, and God has given me a new birth: may I never forget his mercies to me! 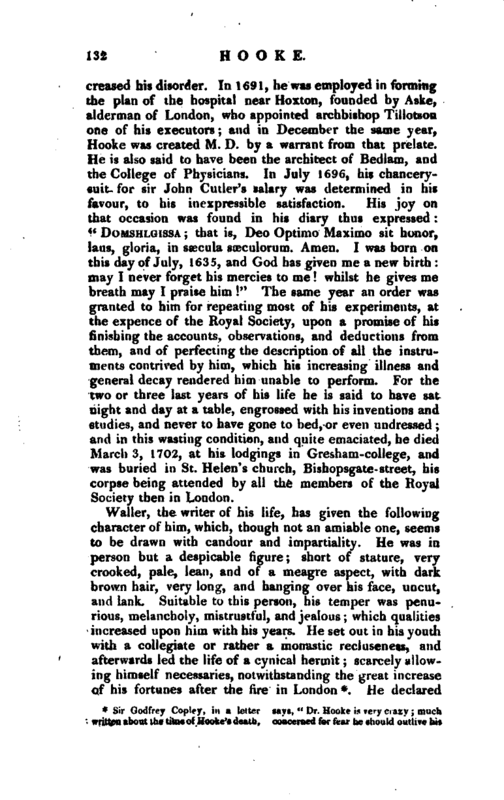 whilst he gives me breath may I praise him!” The same year an order was granted to him for repeating most of his experiments, at the expence of the Royal Society, upon a promise of his finishing the accounts, observations, and deductions from them, and of perfecting the description of all the instruments contrived by him, which his increasing illness and general decay rendered him unable to perform. For the two or three last years of his life he is said to have sat night and day at a table, engrossed with his inventions and studies, and never to have gone to bed, or even undressed; and in this wasting condition, and quite emaciated, he died March 3, 1702, at his lodgings in Gresham-college, and was buried in St. Helen’s church, Bishopsgate- street, his corpse being attended by all the members of the Royal Society then in London. estate. 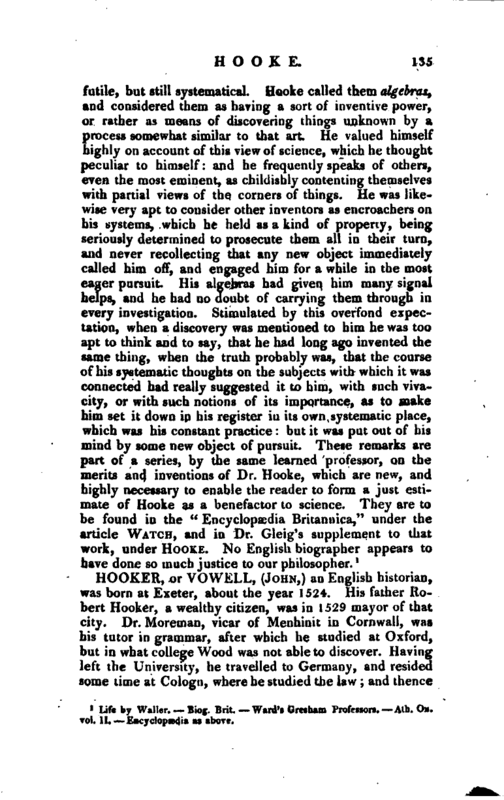 He hath starved one old woman already; and I believe he will endanger himself to save sixpence for any thing he wants.“In another, written a few weeks after his death, Sir Godfrey says, ”I wonder old Dr. Hooke did not choose rather to leave his 1-2.000l. to continue what he had promoted and studied all the days of his life, I mean mathematical experiments, than to have it go to those whom he never saw or cared for. It is rare that virtuosos die rich, and it is pity they should if they were like him." Dr. Ducarel’s Mss. in Mr. Nichols’s possession.